A chop saw is otherwise known as a miter saw - a highly popular power tool. The five best chop saws, reviewed and compared. A chop saw is a relatively light power tool and used for making precise angled cross cuts in lumber or metal stock. They're surprisingly useful and take the labor out of miter saw work and straight cuts. A few adjustments allows the user to alter the cut, match angles across a variety of mediums and all done through the touch of a button or two. Before you make the final choice you're well advised to determine which one best suits your needs. They come in variety of sizes, different manufactures incorporate different factors - as an e.g. some of the more expensive models are also sliding chop saws, which may well make it top quality but - do you need a basic model or one with all the bells and whistles? As a gauge, the five best chop saws are featured below. They're the most popular models, the best overall value for money and of course - they're high on the ratings factor. Any one will produce a great finish - all you have to do is pick the best match re budget and need. 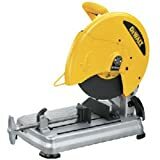 This is the best selling chop saw and comes from the Dewalt brand. It delivers high end cross cuts effortlessly - and possesses enough features to keep it on the best seller list with ease. Currently on offer at well under 200 bucks, this is a reliable power tool, well designed and manufactured to a high spec. The blade is a 14" - which will cover most bases, and the spark guard deflection is impressive. Blade changes are beyond easy and it produces precision results whatever angle it cuts at. The pivoting fence is well designed and switching from 90º to angle cuts is a breeze - not to mention the accuracy of the cuts for such an efficient change over. Comfortable to work with and use, quality manufacture - if you're budget conscious yet big on quality the Dewalt won't disappoint. 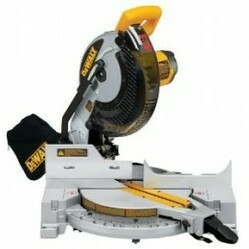 This is another 14 chop saw and also a big favorite. Slightly more expensive than the Dewalt, the Milwaukee offering is pretty similar in build quality and design. A quick blade change system, comfortable handle, and awesome power output driven along by an gutsy 15 amp motor. It's cutting ability is impressively - able to handle large stock pieces, and easily switches between angled and straight cuts. What's the difference between the two? The Dewalt is a bit lighter - both in weight and price. That is benefit enough to most people. Otherwise they both a quality job on metal stock, they're stable, rugged and heavy duty - and definitely worth the purchase price if you're more than a hobby metal worker. Both are industry standard and will cope with being used and abused day after day - and both are best selling power tools. The Dewalt sliding chop saw is the best all round model - in terms of both quality and value for money. The comparable model is a Makita and they share most things design wise yet this one is under 200 bucks. It's 10", driven by a 15 amp motor with 5000 rpm's (denotes faster cutting) and the base set-up - bevel, sliding fence, miter detent plate and more all promote accurate results and productivity. This one's lighter, 35lbs total weight, comfortable to use and a breeze to operate. The dust blower is effective and it deals with crowns, moldings and 2-by stock without issue. It's quiet when operating, feels as rugged as it gets and everything about it's a quality manufacture throughout. It lacks a laser and a couple of fences (against the Makita) but for the main - you're getting a big bang for your buck. A winning power tool. This is another best selling chop saw and comes in once again at under 200 dollars. It's a flexible power tool, able to cut both wood and lightweight metal stock. In truth it does produce admirable results with metal pieces - clean cuts, no burrs left to sand off and cuts cold, lacking the need for coolant. The motor is a powerful 1800, it clamps stock with a firm grip and it's lightweight enough to move around yet durable enough to handle whatever you need to run the blade through. It's a great all-rounder, a compact yet mighty workhorse and if you're looking for a saw that rips through stock leaving a top quality straight cut - this is the one to buy. This is a metal chop saw - and manufactured by trusted brand name Makita. The 15 amp motor powers along at 3800 rpm - good enough and gets the job done. The spark guard is effective and easy to use, and though it's not a no-tool quick-change blade, it does come with the required wrench included in the price. The guide plate swivels easily enough through 45º and the results are as accurate as they need to be. The base is solid, providing stability and the noise and vibration levels are surprisingly low. The vise clamp does a great job of clamping stock firmly in place and overall it's a well put together saw and typical of the quality you can expect from Makita power tools. Well built, contains all the features a saw of this standard should contain and an affordable 170 bucks.